The CD, which comprises recordings by artists signed to Jones’ CAJO International label, covers vast terrain in terms of musical styles and content. The set includes new tracks by Erica Cumbo, Milliyon, Messenja, Clarence Jones and Ramona Estell. Says Jones, “This CD is a true representation of the music and the messages that my artists and I have enjoyed sharing with the world during our tours and other appearances. I’m excited to be able to share it with our fans via this special compilation CD.” Jones said he and his management team and marketing/publicity staff are gearing up for an extensive marketing campaign to propel the project. 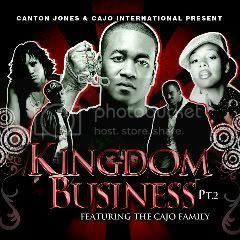 “Kingdom Business II” pre-sells for $8 at cantonjones.net and will also be available on iTunes and Amazon. Marketing for the release will include production of four music videos, direct push to more than 750 ministries, online marketing and a tour. With three albums (“20 Years, 3 Months, 12 Days,” “Love Jones,” and “The Password: Access Granted”), a Grammy nod, a Stellar Awards nomination, three Gospel Choice Awards and, most recently, a Dove Awards nomination to his credit, Jones is busy preparing for the release of his fourth CD, a compilation featuring members of his CAJO International label. This summer, Jones will join an all-star roster of artists participating in Rock the River, a multi-city tour along the Mississippi River. Sponsored by the Billy Graham Evangelistic Association, the tour also features performances by Flyleaf, Kirk Franklin, Red, Skillet, DecembeRadio, and Hawk Nelson.